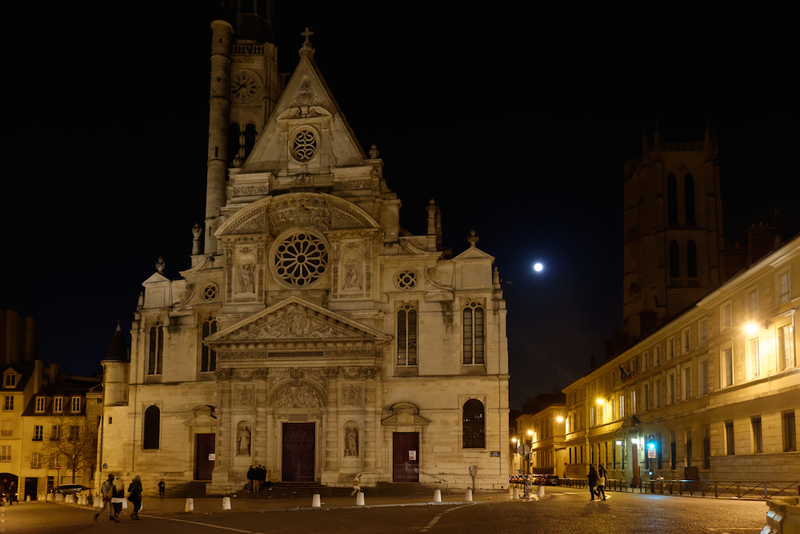 The Church Saint Etienne du Mont that we can see today was built in the 16th and 17th century and is a very harmonious blend of Gothic and Renaissance styles. The inside of the church is also really worth the visit as it shelters two wonderful works of art: the choir screen (we call it the “Jubé” in French) which is the only one that you can see in Paris and which is made of stone so finely cut that it looks like lace; and the stained glasses which can be admired in the ambulatory and in the cloister’s gallery. Do not miss them ! 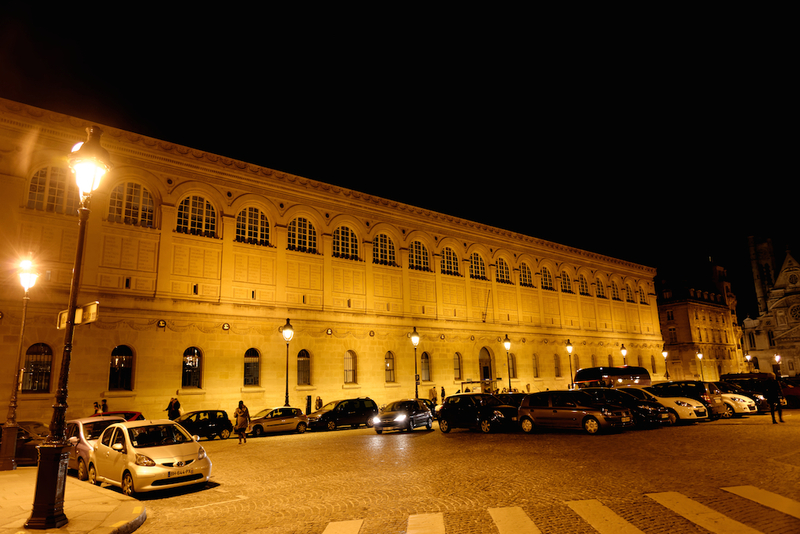 The Bibliothèque Sainte Geneviève is a university and public state library which offers an exceptional collection of works and books. 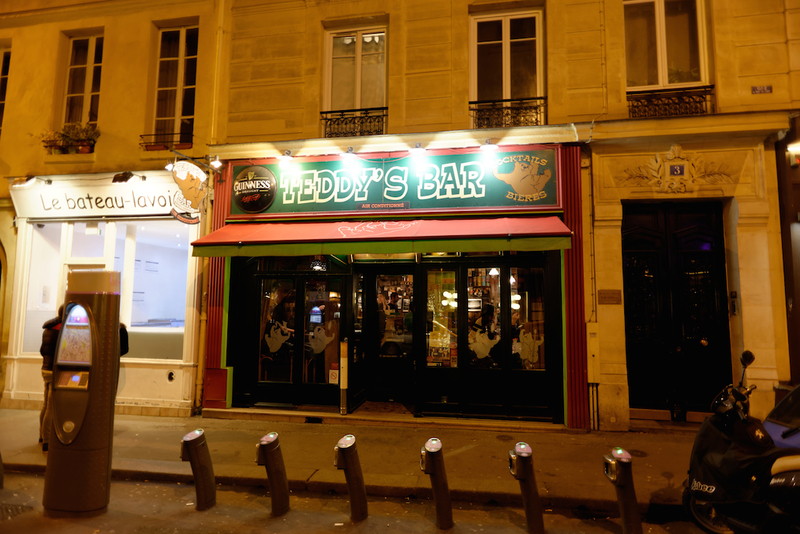 Many students of the high schools and universities of the Latin Quarter spend a lot of time there. The library was built in 19th century by the French architect Henri Labrouste and has a sober and symmetrical facade. The names of 810 authors and scientists are engraved under the windows and classified in chronological order. The inside of the library is also worth seeing with its marble floor, its cast-iron structure and its wooden furniture. 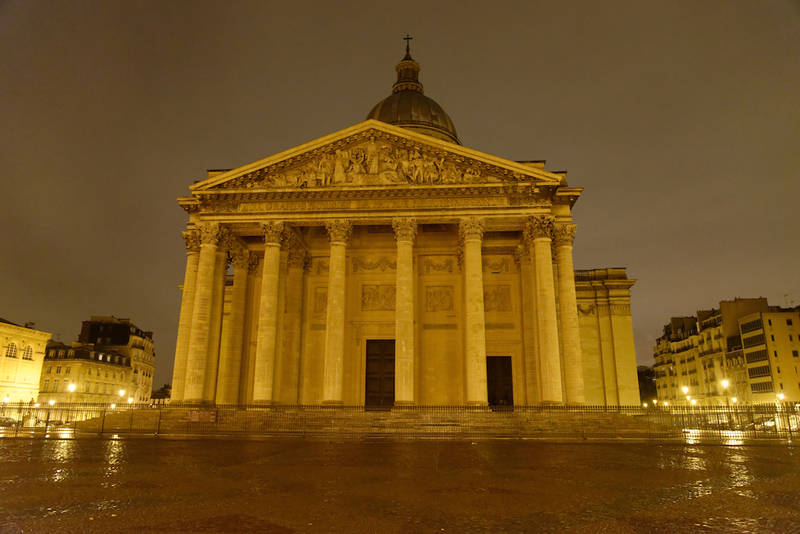 The Pantheon is the most famous buiding located on top of the Montagne Sainte Geneviève, much more famous than the church and than the library. 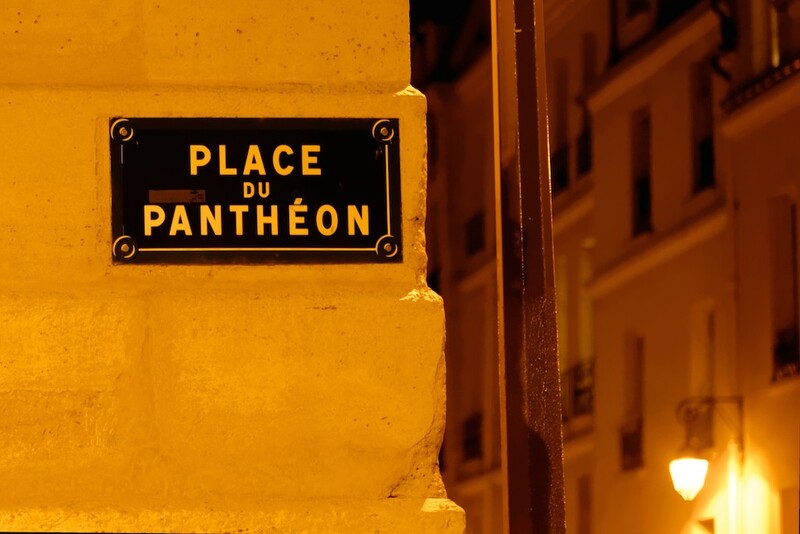 It was built in the end of 18th century by the French architect Soufflot who gave his name to the street which leads from the Pantheon to the Luxembourg Gardens. 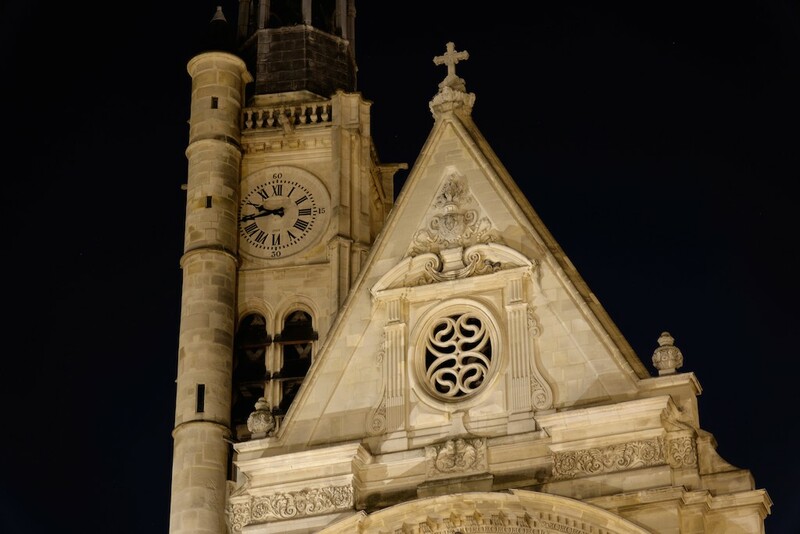 It is really worth the visit due to its architecture and to all the famous people buried in its crypt. The dome is under repair for more than two years now and is not very photogenic. That is the reason why I did not take any picture of it last night… but here is a photography taken more than two years ago. The renovation works should be ended soon! 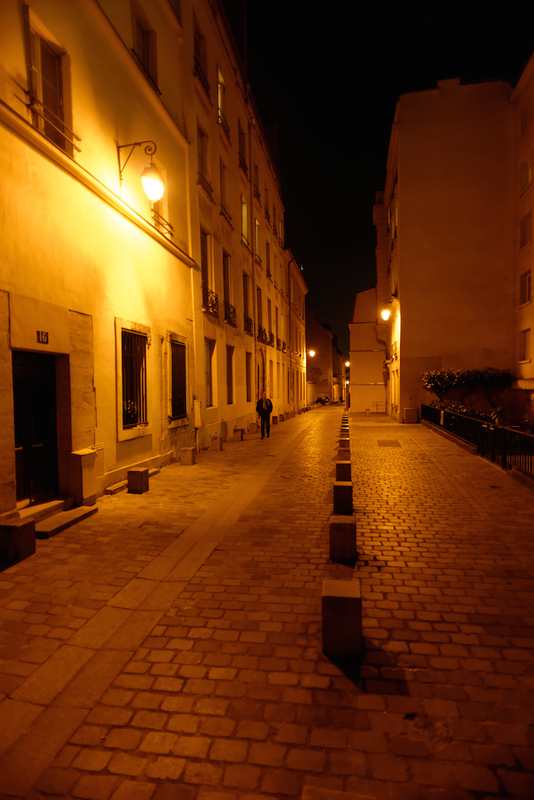 From the Place du Panthéon towards the Place de la Contrescarpe we first took the rue Clovis which runs along the Church Saint Etienne du Mont and at the first crossing we turned right in the rue Descartes. 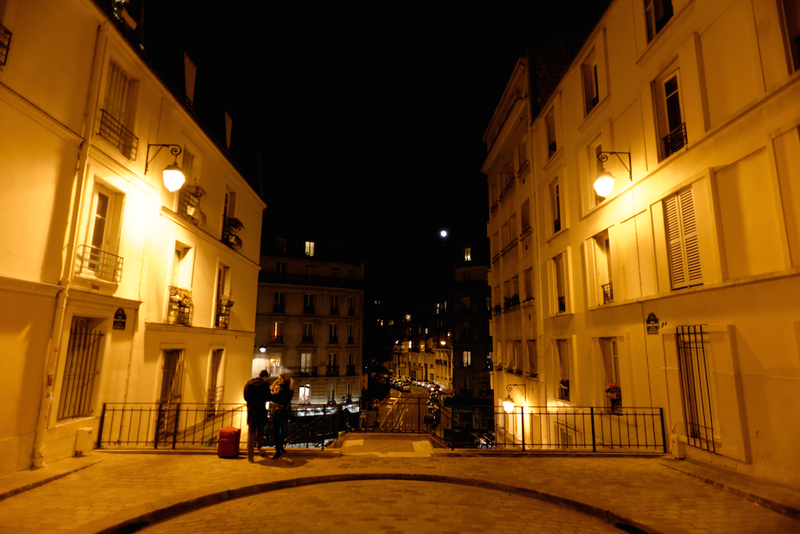 The change of atmosphere is really striking: we left majestic monuments and deserted streets at night behind us and entered very lively and narrow streets. 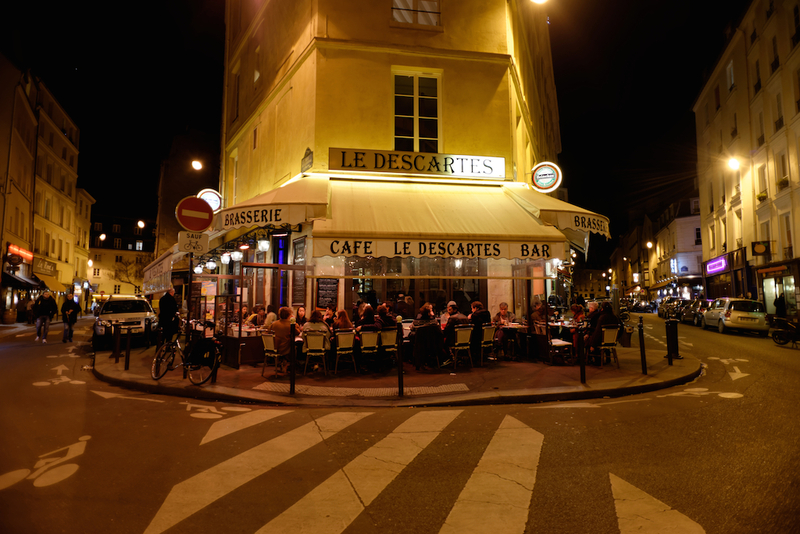 In the rue Descartes and then in the rue Mouffetard and in the rue Thouin, there is one bar or restaurant after the other. 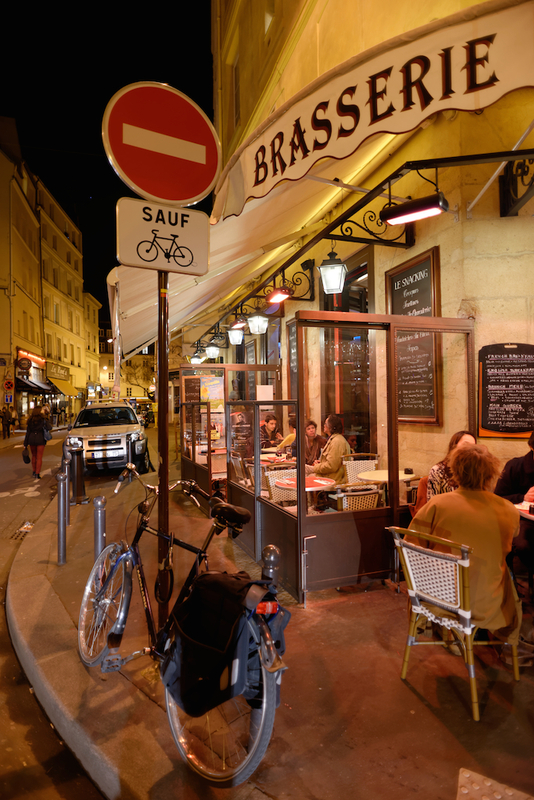 The streets themselves are full of people smoking and talking as smoking is now forbidden inside the restaurants. 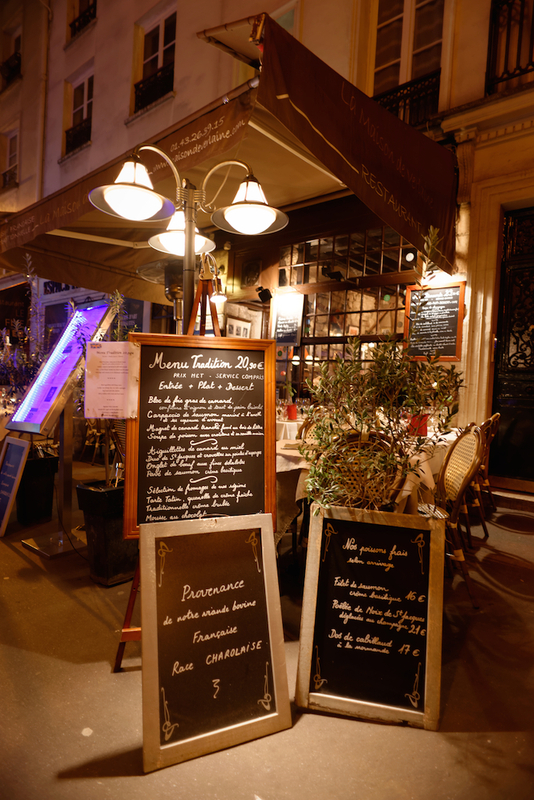 Most of the bars or restaurants have been existing for many years; they offer good value for money and one can have dinner there without hesitation. 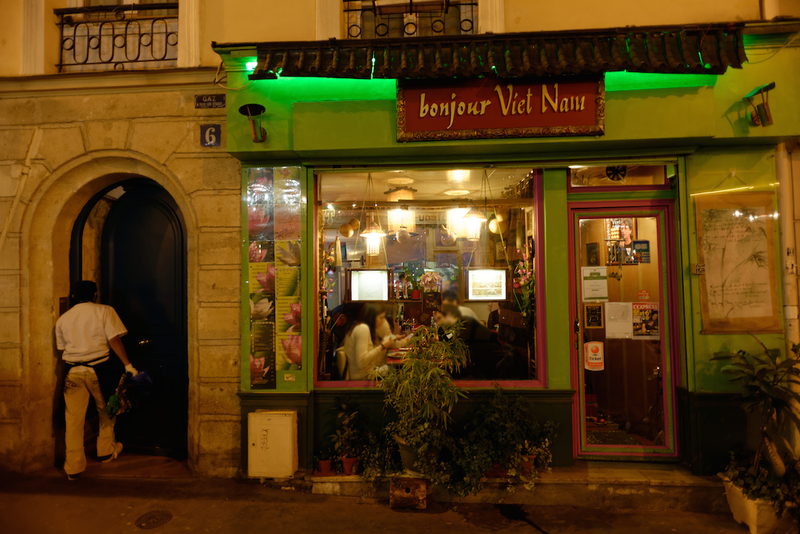 You can either enjoy a typical French meal (for instance at the restaurant Le Volcan) or choose between the numerous world food offered : Vietnamese, Spanish, Greek, Mediterranean, Irish, … My favourite place where to have dinner is the Savannah Café at the very beginning of the rue Descartes when you come from the rue Clovis : the Lebanese and Mediterranean food is delicicious, the decor and Richard’s welcome are very warm and the music excellent! 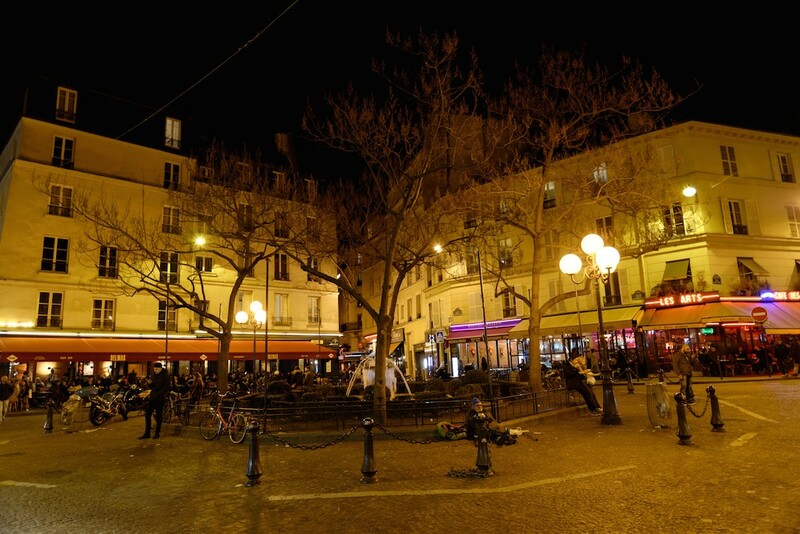 The Place de la Contrescarpe is one of my favourite squares in Paris where to have a drink or a lunch. 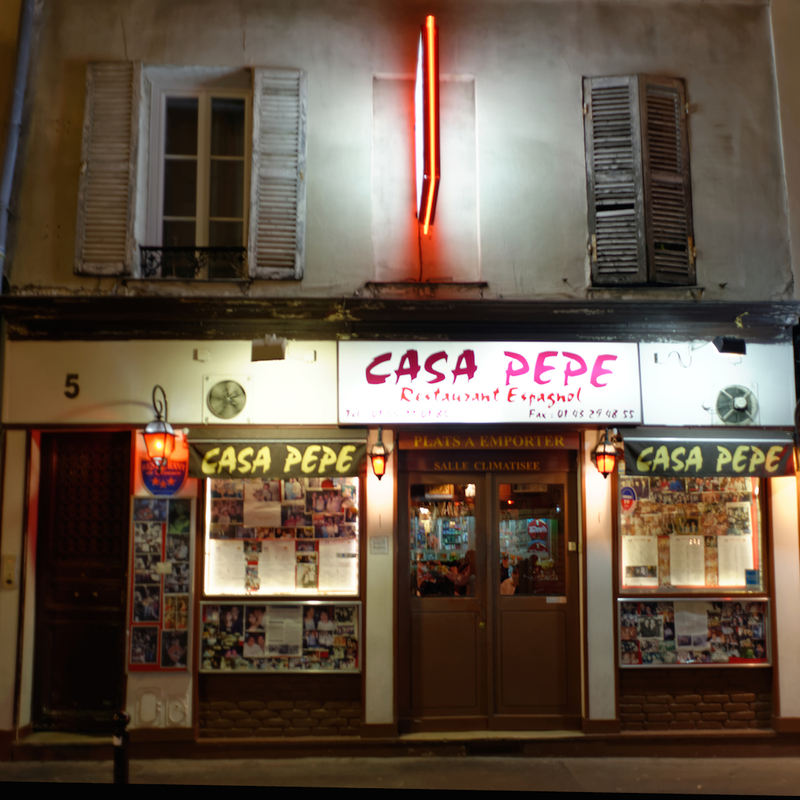 It is located right in the middle of 5th arrondissement of Paris and is a small charming place with a friendly village-like atmosphere. 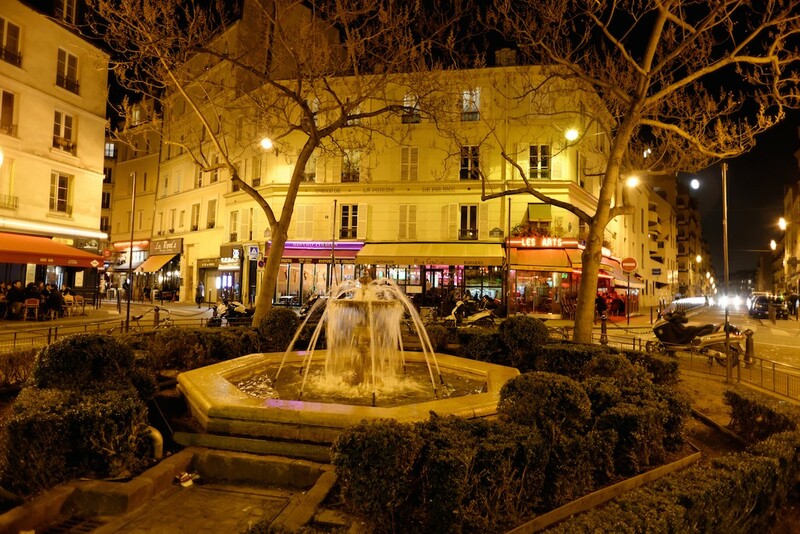 But it is also an historical square where French writers of the 16th and 17th century used to meet : One can still see today the sign of the former tavern ‘La Pomme de Pin’ where Rabelais, Ronsard, Du Bellay, … used to spend time more than four hundred years ago! 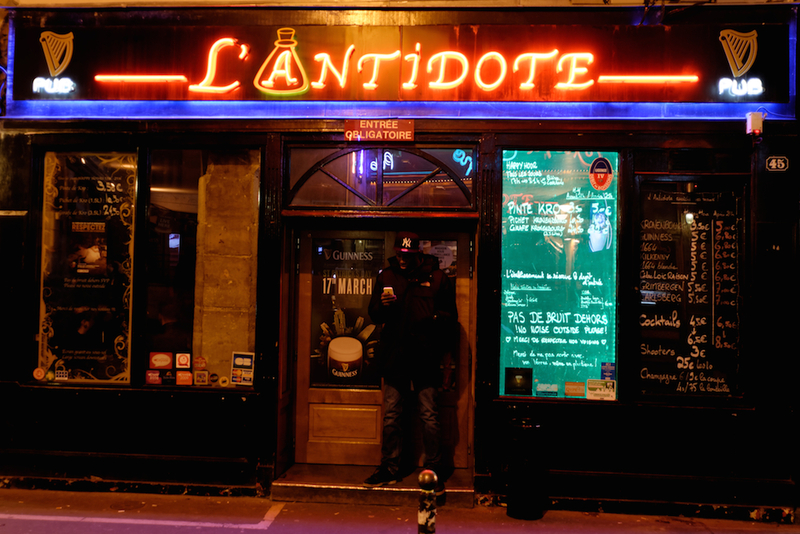 The sign can be seen above a pleasant burger restaurant called Petit Gaston Burger… that I can recommend. 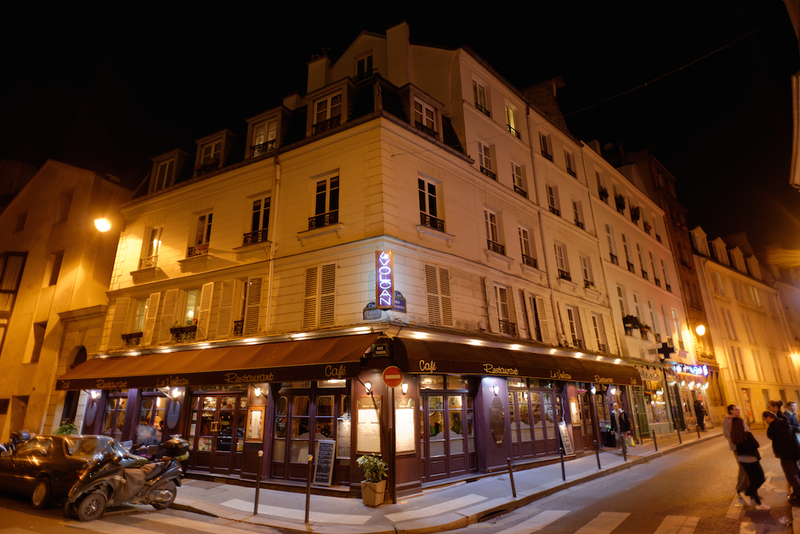 The sixth and last stop of our walk was the Rue Rollin. 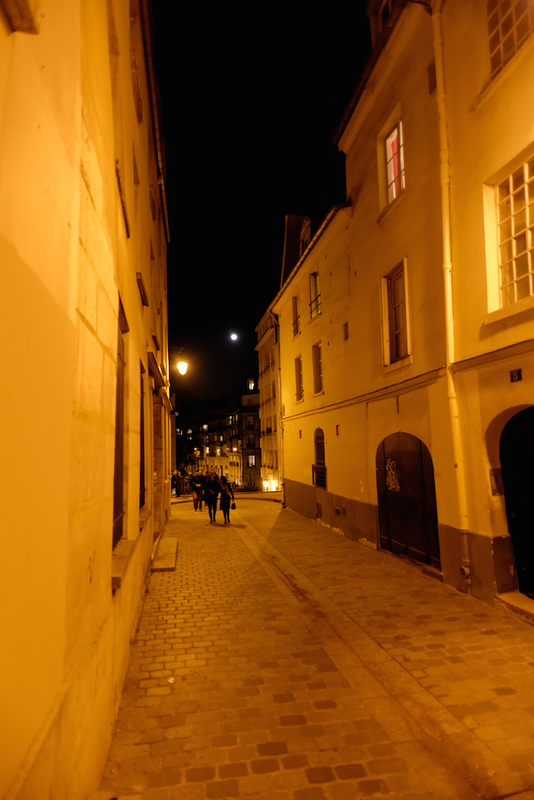 It is an old cobbled pedestrian street with a very special atmosphere and which ends with a flight of stairs. Halfway down there is a beautiful fountain and down the stairs one can reach the rue Monge and the Arènes de Lutèce, which are archeological remains of much older times! 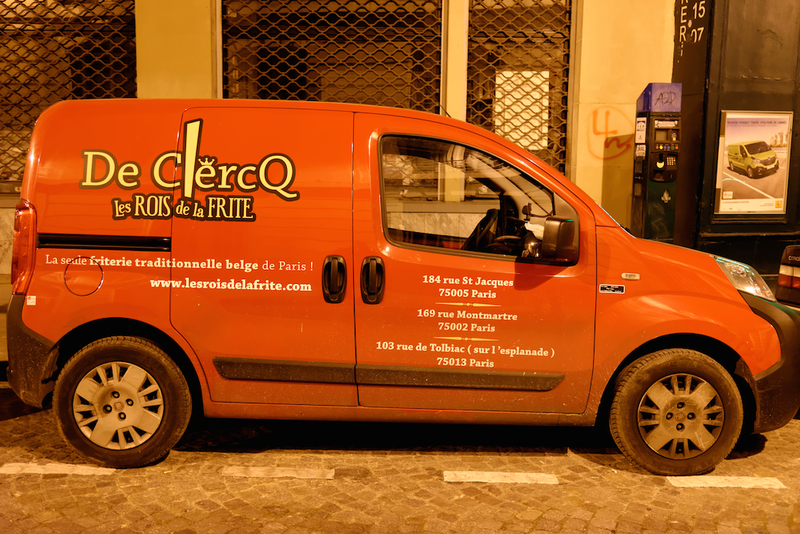 This was the end of our night tour as my walk companions had arrived to their B&B which is located in front of the Arènes de Lutèce. I hope you have enjoyed it as much as they did. Beautiful pictures! It looks like in the movies. 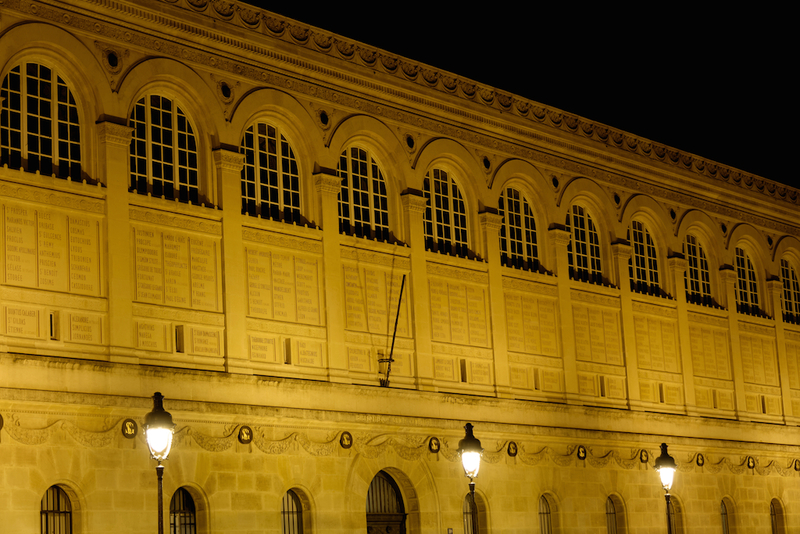 Next Next post: Velazquez Exhibition in Paris: A Must-see until 13 July!